I learned how to make coffee when I was quite young. During the time period that I grew up in, drinking coffee was a way of life. Every home had a pot of coffee on the stove almost all day long. 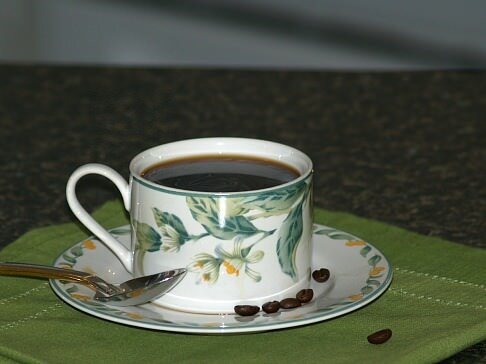 When you visited a friend or family member or if someone visited your home, it was considered rude if you did not invite them to share a cup of coffee or java as Dad called it. It was important back then that every homemaker learn how to make coffee and make it “good”. Everyone did not learn to make coffee the same way; some cooked the coffee directly on the fire and some did have an electric coffee percolator. The coffee tasted different from home to home. We always laughed at how Mom made coffee; I think maybe her way is European. Every time Mom bought a new coffee maker, she would throw away the insides of the pot. She would put the coffee in the pot, add cold water and boil it on the stove top. A few minutes after turning the heat off, the coffee grounds would settle to the bottom of the pot and she would pour everyone a cup of her coffee. Needless to say Mom’s coffee was strong and flavorful. Learning how to make coffee depends a lot on the taste of friends and family members who surround you. People generally do not agree on how strong the coffee should be, the type of equipment to make the coffee in or even the type of coffee to use. Today, we have so many choices and everyone has a different opinion. Personally, I prefer to make my coffee in an electric percolator; the quality is the same every time. There are many good quality coffee beans; I do prefer the coffee beans and grinding them fresh each time is best. You will also find on the grocery shelves instant coffee, regular or freeze dried coffee; these are available in regular or caffeine free. You might want to try some samples of these before deciding on which taste you prefer. After a couple of decades when we saw coffee drinking almost vanish from society, we saw a huge increase in coffee shops and cafes pop up all over the country. Meeting for coffee and chatting over a cup of coffee has become a very popular form of socializing. The new trend today is learning how to make coffee in the home. It has become very expensive just to have coffee out in the cafes. With the huge weight on our economic conditions today, many people are finding serving coffee in their homes to be a great alternative to the commercial coffee bars. Learning how to make coffee and setting up your own coffee bar is a great way to entertain for Easter brunch, any holiday gathering or just for a social gathering. A coffee bar can be as simple as placing a coffee maker on a countertop or table. I like to cover the table with a clean white tablecloth making room for the cups, saucers, spoons, napkins and any types of ingredients I want to include. If I choose to serve a couple different types of coffee I will pour them in large thermoses and set them on the table also. For learning how to make coffee, a few guidelines must be followed. First, the coffee pot needs to be washed with hot soapy water and rinsed thoroughly with hot water each time before using. This removes any oils left on the sides of the coffeepot making a better tasting pot of coffee. The water used in making coffee has a huge effect on the quality; it should be pure cold water with no chlorine or minerals. If your water is not filtered then use bottled water. When you learn how to make coffee, you will see that freshly ground coffee beans make the best coffee. Buy the “grind” to match your coffee maker; percolator, drip, etc. If the grind is too coarse or too fine it will affect the flavor of your coffee. Generally speaking allow two level tablespoons of coffee for each six ounces of water. Depending on the taste of your guests, you may choose to cut back a little or increase the coffee a little. Sometimes, if I am serving a large crowd, I will offer a lighter pot of coffee and a stronger pot. Once you have learned how to make coffee and you want to set up a coffee bar in your home, you might want to choose a variety of ingredients to offer on the bar. Half and half, granulated raw sugar, sugar cubes, chocolate shavings, nutmeg, cinnamon sticks and whipped cream are some good choices. Liqueurs make a great addition; Kahlua, Crème de cocoa, Truffles, Amaretto, Grand Marnier, Irish mist and Frangelico. Add a tray of good cookies, a cake or coffee cake and you are ready for the party to begin. I am sure you have all seen those chocolate coated spoons that are so nice to flavor a cup of coffee. They are quite expensive to purchase but so much more economical to make at home. You can use your own silver spoons, disposable plastic spoons or long cinnamon sticks to make them. For the chocolate use semi sweet or dark chocolate. If you are learning how to make coffee, you should know some of the different names in order to be able to mix them correctly. An AMERICANO is an espresso which has been diluted with hot water to make it less intense. A CAPPUCCINO is espresso with steamed milk and frothed milk (*see note below) in equal proportions. Garnish top with sprinkled chocolate, cocoa powder, cinnamon or sugar crystals. NOTE: FROTHED MILK can be made at home without a special machine. Shake milk in a glass canning jar to create a foam. Then place it in the microwave for a few seconds to stabilize the foam. A DOPPIO is a double portion of espresso. A LATTE is coffee made with steamed milk usually at q 1 to 3 ratio. It can be made with flavored syrup and topped with milk froth. A LATTECCINO is an extra creamy and frothy cappuccino. A MACCHIATO (meaning “marked”) is a single serving of espresso marked with frothed milk. A LATTE MACCHIATO is a single serving of espresso poured into a glass of steamed milk to “mark” the milk with espresso. Combine chocolate and whipping cream in cup; melt in microwave about 30 seconds. Stir in almond extract; dip spoons in chocolate ¼ up the handle and allow excess to drip off. Place spoons on wax paper lined tray; freeze until set. Place vanilla candy coating in zip lock bag and snip tiny corner off. Drizzle coating over chilled spoons; store in refrigerator until serving. 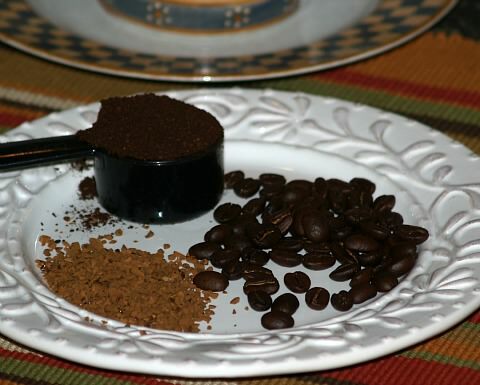 The following three are some great instant coffee blends to serve on a coffee bar. It makes it very simple when all you need to add is boiling water. 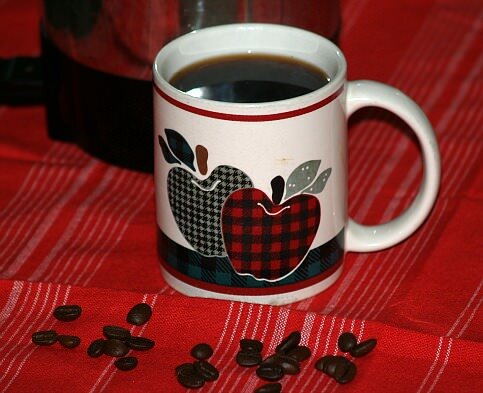 For each serving just add 2 tablespoons of the coffee blend to an 8 ounce cup of boiling water. Combine all the ingredients to each of the following recipes in a blender and process until smooth. When serving these on your coffee bar, make labels and place with the mixes so your guests will know what they are and how to fix them. Learn how to make coffee Mexican style! Place coffee in coffee filter basket; add cinnamon and nutmeg. Add water to coffeemaker, brew according to manufacturer’s directions. Combine brown sugar, chocolate syrup and milk in heavy saucepan. Cook over low heat stirring constantly until sugar is dissolved; stir in coffee and vanilla. Serve immediately top with whipped cream and sprinkled with cinnamon. Combine coffee, Kahlua and brandy in a large container stirring well. Pour into 8 coffee cups; top with whipped cream and sprinkle with cinnamon. Add coffee. Brandy and sugar; stir until sugar melts and remove from heat. Beat whipping cream and vanilla on high speed until soft peaks form. Fold whipped cream into coffee mixture and serve immediately. Gradually add the milk and coffee granules to the marshmallow cream. Beat slowly with electric mixer until combined and blended. Stir constantly until marshmallow has melted. Serve warm or chilled. Serves 4 one cup servings. Combine and mix together sugar, cocoa, lemon peel and bitters. Put mixture in an airtight container and store in refrigerator. Spoon 1 ½ Teaspoon of cocoa mixture in a coffee cup. Stir in coffee and 2 tablespoons liqueur; garnish with whipped topping. Combine and mix together whiskey, instant coffee and sugar in a 7 ounce coffee mug. Bring water to a boil; gradually add water filling cup about 2/3 full stirring until sugar dissolves. Spoon whipped topping on top of cup. Makes one ¾ cup serving. Pour chocolate syrup and bitters into coffee pot. Place coffee, bay leaves and peel in basket lined with paper filter. Pour water into coffee maker and brew according to coffee makers directions. Top with whipped cream; Makes 3 to 4 servings. Place cinnamon and cloves in a spice bag (tie in cheesecloth); set aside. Combine coffee, syrup, sugar and anise in a slow cooker; add spice bag. Set cooker on low; cover and cook for 2 to 3 hours. Pour into mugs; top with whipped cream and garnish.